• Having your home resided before winter eliminates the air infiltration from the outside, especially on cold, windy days. A tighter home means lower heating bills, saving your energy dollars month after month. You’ll also prevent water from seeping into your home from leaks around window or door frames or around the foundation areas of your home. Leaks contribute to mold growth that’s invisible to you, and if it’s left unchecked, the damage to your home can be extensive. • Taking off the old siding gives you a chance to improve the insulation inside your exterior walls, which lowers the amount it costs to heat and cool your home. If your home is older, it’s likely that you don’t have enough, or it’s degraded over time. Whether you remove all the old insulation or just replace problem areas, you’ll see the difference in your heating bills. • Working outdoors is more comfortable in the fall and there’s enough daylight, so crews have enough time each day to finish the job more quickly. Scheduling the project during milder weather may save you money, as well, since the contractor is likely to include travel and fuel charges into the bid. Longer work days mean that it’ll take fewer trips to your home to complete the job. • Replacing the siding before the thermometer plummets means that the crew may be able to strip away the old siding in one process, which saves labor and minimizes the mess that siding removal creates in your yard. In the winter, crews may have to remove the old siding a section at a time, which means that it’s harder for the contractor to bid the project using the economies of scale that production work affords. 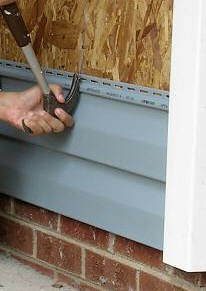 • Caulking and painting dry and seal better when the weather is cool to mild. Some types of paint can’t be used when temperatures drop below 50 degrees F, and exterior caulks are best applied when temperatures are over 40 degrees F.
• Sealing up your home with new siding in New Jersey keeps insects from burrowing inside your home. New siding forms a tight seal around your home’s exterior and it eliminates the smallest crevices that bugs or vermin use to spend a warmer winter indoors. Heating Systems 101: Electric Underfloor Heating Explained What Can Go Wrong With Curtain Walls?